I've come to really enjoy Call of Duty: Advanced Warfare's multiplayer months down the line. It's withstood the test of time, and although I was skeptical of Sledgehammer Games' first Duty outing, it has done a decent job at differentiating itself from Treyarch and Infinity Ward, and in most ways, it has already surpassed the latter. The latest pack is Ascendance, which brings in a few extras outside of the typical four-map, one-zombie level delivery system. It's a better effort than Havoc thanks to the injection of some grappling hooks, but for $15, not every piece of the puzzle carries its load. 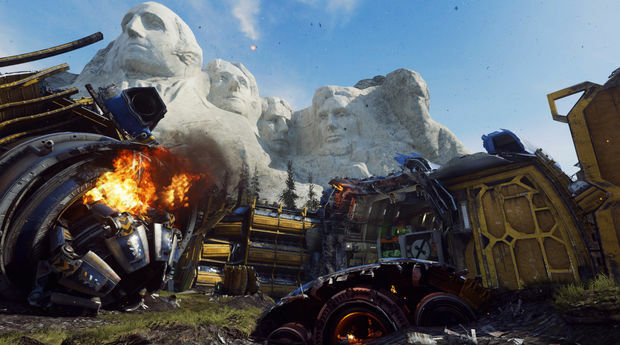 Site 244 is Call of Duty's take on Mount Rushmore, with a tad more destruction and radioactive waste to boot. Set to the theme of a ruined test site, the map looks cooler than it actually plays. The constant attention to detail is something you'll notice immediately, and the actual mountain itself isn't immediately apparent unless you look up in the distance. Unfortunately, the cheap crag-like layout feels limiting in a game that's supposed to be about freedom of movement. The layout is handicapped by "paths," which are basically just giant crags that block you from experimentation and herd you into various chokepoints. Because of its aesthetic value I don't necessarily vote to skip it during the loadout screen, but I'm not thrilled with it either. Another map in the bunch, Climate, follows the same style-over-functionality principle with a gorgeous design and a boring layout. It reminds me of Zoo on paper, one of my favorite maps of all time, but the layout itself is similar to Site 244 in that it feels far too restrictive. It's very flat outside of one particular quadrant, and you'll spend a lot of time shooting across long stretches and hallways, which feels counter-productive with an outdoor map. Filling the area with acid is a nice touch that occurs later in a match, but it's not enough to really make this one stand out. 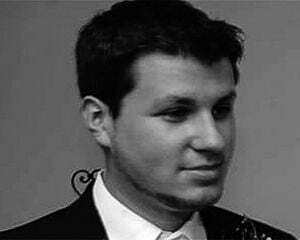 One arena shines above all others in the pack -- Perplex. It takes place in a five story apartment complex in the heart of Sydney, Australia, and it's just as amazing as it looks. Both the background (with the Sydney Opera House and active sailboats) and the interiors of Perplex look painstakingly crafted, and you can even see the details like the weather channel on TV, which at this point, is actually visible on-screen sans blur. It doesn't end there though as the design is genius, providing a five-story meta-game that has players constantly moving up and down to get a proper vantage point. 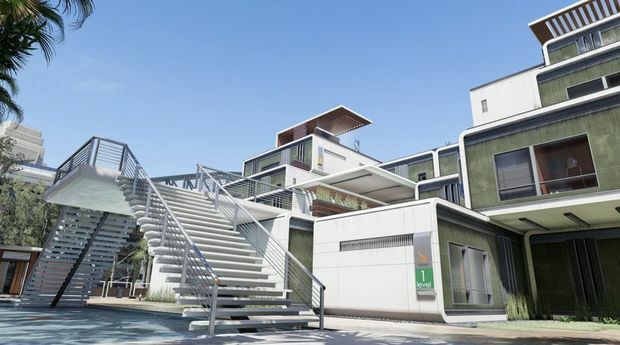 It's also neat to see new modular apartments being flown in by drones, which end up being part of the level. 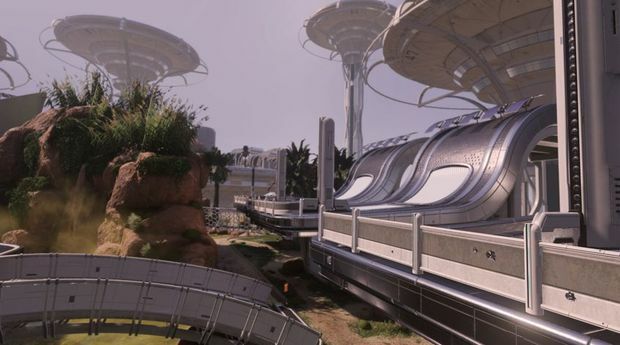 As a welcome surprise, Perplex is now one of my all-time favorite new Call of Duty maps. With the new grapple playlist (more on that in a second), it's even more enjoyable. While Site 244 and Climate felt different enough to justify the identity of the DLC, Chop Shop just feels like a decent map that should have been included in the base game. It feels like a mix of Horizon and Ascend from pretty much every angle, which you already paid for. Every time I geared up for Chop Shop it didn't feel premium in any way, but it's a decent map for objective-based games if that's your thing. To add a little oomph to Ascendence, you'll also net the OHM-Werewolf gun, as well as the aforementioned grapple playlist. The weapon itself is an SMG-shotgun hybrid that shoots blue energy bullets, able to switch between both modes of fire with a quick d-pad tap. It feels new without being overpowered, as you're inherently limited by your lack of range no matter what toolkit you use. The grapple playlist ended up being a joy to play, as everyone's Exo powers are eliminated and replace with a grappling hook, which can be used mid-jump or to scale pretty much anything. With a low cooldown meter you can pretty much grapple at all times, and it's just as fun as it sounds. 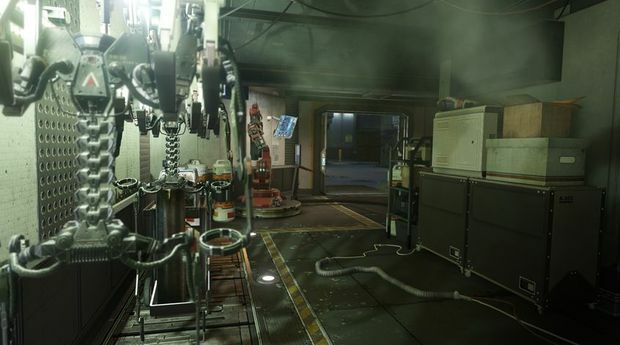 Of course, the main attraction for many is the Exo Zombies mode, which also comes with a new map called Infection. It takes place in a decidedly less industrial setting, with a burger joint and an interconnected sewer system. Long time fans will remember Burger Town, which has been a "Pizza Planet"-like Easter Egg since Modern Warfare 2. The more I play Exo Zombies the more I really start to see the effort that was put into it, as zombies don't just aimlessly shamble along through windows like they did in the past -- they slip through cracks and dynamically approach you throughout the level, even if their spawn points are scripted. It's also nice to see Activision commit to an interesting cast (Bill Paxton, John Malkovich, Rose McGowan, and Jon Bernthal) rather than have them as a one-off like past DLCs. The Exosuit (once you locate it) continues to add an extra layer to the classic co-op formula, as double-jumping and air-dashing is still just as exciting when you're running from zombies. And you'll need to run, as there's plenty of formidable foes that can infect you or shut down your Exosuit temporarily.